It has been requested that this article be rewritten and expanded to include more information (tagged on November 10, 2017). 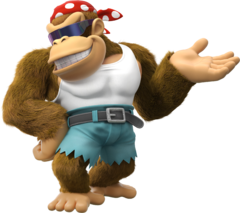 Funky Kong is a Kong Family member inhabitant of Donkey Kong Island and is one of Donkey Kong's friends. Funky Kong debuts in the game Donkey Kong Country and has made various subsequent appearances since, often selling or offering some service to his friends. He occasionally appears as a playable character in spin-off games. Funky Kong first appears in Donkey Kong Country as the proprietor of Funky's Flights, an airplane service. Found in every area of Donkey Kong Island, Funky will allow both Donkey and Diddy Kong to utilize his Funky Barrel to travel to areas of the island they have cleared of King K. Rool's operatives. As well as running Funky's Flights, Funky, in the Game Boy Advance remake of Donkey Kong Country, runs Funky's Fishing where a fishing minigame can be played. Funky Kong returns in Donkey Kong Country 2: Diddy's Kong Quest, where his role is relatively the same as his debut appearance. Found in Funky's Flights II, which is located in every area of Crocodile Isle except the Lost World, Funky will allow Diddy and Dixie Kong to use his Biplane Barrel to fly to areas of Crocodile Isle that they have previously visited. Unlike in Donkey Kong Country, the Kongs will need to pay a certain number of Banana Coins to use the Biplane Barrel, though all trips after the first will be free. Funky does not wear his tank-top in this game. Funky Kong's role is expanded upon in the Game Boy Advance version of Donkey Kong Country 2: Diddy's Kong Quest. Here, instead of owning the Biplane Barrel, Funky has a Gyrocopter, which he will allow Diddy and Dixie to borrow for their adventure if they succeed in beating a mini-game with it. Additionally, at the various Funky's Flights II on Crocodile Isle, Funky will give Diddy and Dixie DK Coins if they beat his minigames. Funky also appears at the ending of the game, planting a bomb on King K. Rool's Flying Krock and rescuing Diddy, Dixie, Donkey, and Cranky Kong from it before it detonates. Similarly, he also appears in the true ending where he uses the Gyrocopter to foil Kaptain K. Rool's escape. In Donkey Kong Land 2 for the Game Boy, Funky Kong’s role is exactly the same as in Donkey Kong Country 2: Diddy’s Kong Quest, with him allowing Diddy and Dixie to use his Biplane Barrel to travel to areas they've previously been to, for a price. In Donkey Kong Country 3: Dixie Kong's Double Trouble!, Funky Kong runs Funky's Rentals in the Northern Kremisphere, near Bazaar's General Store. At the beginning of the game, Dixie Kong must visit Funky in order to pick up her cousin and partner throughout the game, Kiddy Kong, as well as the Motor Boat. As Dixie and Kiddy progress through the game, they can gain various items and give them to Funky, who will use them to create new, more powerful vehicles for them to use and reach new locations. Throughout Donkey Kong Country 3: Dixie Kong's Double Trouble!, references to Funky working on a "secret project" are made by the Brothers Bear; if Dixie and Kiddy confront Funky about this, he will acknowledge that he is working on something, also saying that for a down payment of every DK Coin in the game, he will let the Kongs see what it is and let them use it. 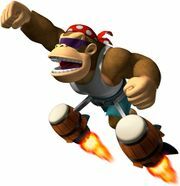 If the Kongs do bring Funky all the DK Coins obtainable, he will give them his Gyrocopter, which they can use to locate the Banana Bird Queen and her last three children. In the Game Boy Advance port of Donkey Kong Country 3: Dixie Kong's Double Trouble!, Funky Kong's role is essentially the same as in the original, with the only difference being that he will allow Dixie and Kiddy to play various minigames in his shop; if the Kongs beat all these minigames, Funky will reward them with a Banana Bird. In Donkey Kong 64, Funky runs Funky's Store, which is a weapons shop where the Kongs can buy weapons and accessories for themselves. Funky Kong will also give away free ammunition if the Kongs visit him and he has nothing available for sale. In this game, Funky is located in every world except Hideout Helm. During the ending cut scene of Donkey Kong 64, it is Funky who delivers the final blow to King K. Rool. As King K. Rool is distracted by Candy Kong, Funky does his bit and fires a boot at him, which knocks King K. Rool through the ceiling of his arena and onto K. Lumsy's Prison. In the credits, Funky also proceeds to mimic various weapons such as aerial bombs and machine guns on a cliff. After six years of not appearing in games, Funky Kong returns in Donkey Kong Country: Tropical Freeze as the owner of the item shop, named Funky's Fly 'n' Buy. In this way, he replaces Cranky Kong's role as the owner of a shop in the previous installment. Funky Kong sells various items to the Kongs in exchange for Banana Coins, including DK Barrels, balloons, Banana Juice, Squawks the Parrot, Heart Boosts, and Crash Guards. He also sells collectible toys from the Capsule Toy Machine. The shop operates on every island in the game except Secret Seclusion. The game's Nintendo Switch port marks the first time Funky Kong is a playable character in the main series, as he is playable via the new "Funky Mode", which is catered towards beginner players. His abilities are aided by his surfboard and include double jumping, hovering, treading on Spiked Floors, and surfing on water in a similar fashion to water skipping. He can perform perpetual Roll Attacks and Corkscrews as well. In addition, he wears a yellow pair of goggles with a snorkel when he plunges underwater, enabling him to breathe without having to collect Air Bubbles. Lastly, Funky's surfboard enables him to safely jump on enemies that most of the other Kongs cannot safely jump on, such as the Snaggles. He can also perform a Ground Pound like Donkey Kong. While playing as Funky Kong, Funky's Fly 'n' Buy is run by a parrot named Tawks. In the 1995 novel Donkey Kong Country: Rumble in the Jungle, Funky Kong owns a custom-built plane made from a Barrel, which he uses to transport clients around Donkey Kong Island. He promises Diddy Kong an exciting ride as a passenger while he performs tricks in the air. During their flight, they notice smoke coming from the long abandoned Big Ape City, which Funky prefers not to investigate because he doesn't enjoy looking for trouble. After Diddy's flight, Funky gets attacked by a swarm of flying pigs near Big Ape City, causing his plane to crash. Donkey Kong, Cranky Kong, and Diddy cross the jungle on foot, to where he has been held captive by the Kremlings within Big Ape City. The Kremlings believe that Funky Kong is a spy, and they intend to use a painful "truth machine" on him, as ordered by King K. Rool. After breaking out of his cell, Funky involves himself in defeating a group of Kremlings, although he is normally "too laid back" to fight. He later inspects his plane in the cargo room, and finds that he is able to easily repair most of the dame, although he requires a new water pump for the engine. He draws a map of the factory so that the other Kongs can find a replacement, due to having seen most of the factory while the Kremlings were deciding where to take him. 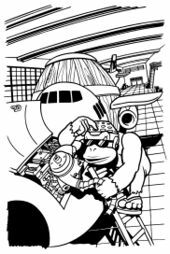 After Funky successfully repairs the engine, all of the Kongs board the plane and Funky flies out from the factory through a hole in the wall. The plane is attacked by the flying pigs a second time, however Funky has the idea to pour the plane's entire banana milkshake supply onto the pigs so that they are no longer able to fly. Funky then maneuvers his plane over King K. Rool's zeppelin, which allows Donkey Kong and Diddy to plant it with TNT Barrels. After destroying the Factory, Funky Kong flies the others back to their tree house in the jungle. In the Donkey Kong Country television series, Funky Kong appears as a major character, with his character being relatively the same as in the games - the adventure loving owner of Funky's Flights and one of Donkey Kong's best friends. As well as enjoying surfing and dancing, Funky is portrayed as exceptionally spiritual in the show, known to talk about subjects such as karma quite often. On the show, Funky is portrayed as having golden colored fur instead of brown, wears more goggle-like glasses and speaks with a Jamaican accent, provided by voice actor Damon D’Oliveira. In the Donkey Kong comic "Bumm-Badabumm im Urwald", Funky (being called "Funky-Kong", with a hyphen in his name) despite not actually appearing in the story, does play a crucial role in it. In the comic, Funky is the one who alerts Donkey, Diddy and Dixie Kong, through drumming, that the Kremling Krew has plundered all the bananas on Donkey Kong Island. In the German edition Club Nintendo, Funky Kong appears in a somewhat minor role in the comic "Donkey Kong in: Banana Day 24", where he appears at the celebration the Kong Family has at its end. In Club Nintendo's comic book length adaptation of Donkey Kong Country 2: Diddy's Kong Quest, Funky makes a brief appearance in the scene where Cranky explains Banana Coins and Kremkoins to Diddy and Dixie. Funky Kong's role in DK: King of Swing is largely minimal, with him appearing only in the opening cut scene, after King K. Rool steals all the Jungle Jam Medals. Funky makes his first playable appearance in the game's Jungle Jam mode, where his partner is Dixie Kong. He has very high strength, like most of his other appearances, but lacks the ability to jump high and far. Notably, this game finalizes his design. In DK: Jungle Climber, Funky, along with the bulk of the Kong Family, goes on vacation to Sun Sun Island. When Donkey, Diddy, and Cranky meet the banana alien Xananab and decide to help in his quest to reclaim his Crystal Bananas, which were stolen by the Kremling Gang, Funky will reopen Funky's Flights. If the Kongs and Xananab collect a certain amount of Oil Barrels, they can give them to Funky to power his Barrel Plane, which can fly them to a smaller version of the island they're on. Funky Kong is also playable in the game's VS. Mode. Funky Kong is an unlockable playable character in the Wii game Donkey Kong Barrel Blast. Here, he is unlocked after the Diamond Cup is won as a Kong character. He shares statistics with Kludge in this game, having abysmal boost and agility, but excellent speed. In Mario Kart Wii, Funky Kong makes his first appearance in the Mario series. He is an unlockable large-sized character, unlocked by obtaining four Expert Staff Ghost Data on Time Trial mode. Funky Kong is the Staff Ghost for GCN DK Mountain. While he does not have his own race course, he does have his own battle arena, the Funky Stadium. Although Funky Kong features a good speed bonus, it is not as good as that of Baby Luigi and Baby Daisy. However, being a large-sized racer, Funky can use the Jetsetter and Spear, which is the fastest kart and bike in the game, respectively. This marks Funky Kong's first and only physical appearance so far in the Mario Kart series, making him, Diddy Kong, and Birdo the only playable characters in Mario Kart Wii to not return as playable characters in later installments. Funky Kong is an unlockable playable team player in Mario Super Sluggers, where he has good batting and decent fielding skills, while lacking in pitching and running skills. Oddly, he's the only Kong in that game who bats with his right hand, while fielding with his left hand. He has good chemistry with all the Kongs and bad chemistry with the Kremlings. He is unlocked after he joins the player in Challenge Mode. A trophy of Funky Kong is obtainable in Super Smash Bros. Brawl, Super Smash Bros. for Nintendo 3DS, and Super Smash Bros. for Wii U. He also appears in Super Smash Bros. Ultimate as a master spirit. He runs a shop called Funky Kong's Shack, where he sells snacks, skill spheres, support items, and spirits that are themed around transportation. 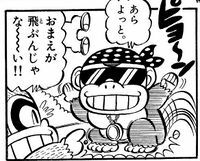 Funky Kong also appears in issue 14 of Super Mario-Kun. He allows Mario, Yoshi, Donkey Kong, and Diddy Kong to ride the Funky Barrel. Additionally, some merchandise based on Funky Kong has been released, most of it based off his appearance in Donkey Kong Country or the television series; this includes objects such as statuettes, plush dolls, mini figures, and keychains. Funky Kong has the same general build as fellow Kongs such as Donkey and Kiddy Kong, being both large and muscular. Funky's fur is generally light brown in color, though the shade of it varies in his appearances and artwork, being either light or dark. 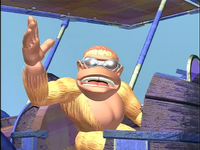 In all of his appearances, Funky wears a pair of sunglasses which conceal what his true eyes look like; however, in Donkey Kong Country, Funky could be seen lifting his sunglasses and revealing a pair of eyes just like Donkey Kong's. Funky's sunglasses were originally black in color in Donkey Kong Country, but virtually all subsequent appearances depict as being purple tinted. In Donkey Kong Country, Donkey Kong Country 2: Diddy's Kong Quest, and Donkey Kong Land 2, Funky Kong's attire is essentially the same, with him wearing a red bandanna with white polka-dots, medals around his neck ("bling"), a purple swimsuit, and sandals. Donkey Kong Country 3: Dixie Kong's Double Trouble! radically alters Funky's appearance, having him discard his medals and replace them with tools slung from a tool belt; Funky also wears a white muscle shirt, blue shorts and black boots in this game. Donkey Kong 64 has Funky radically change his attire once again, with him wearing a navy blue camouflage print attire and army hat, black combat boots and red teashades. More recently, Funky's appearance has remained consistent, being identical to his attire from Donkey Kong Country 3: Dixie Kong's Double Trouble!, with his tool belt being replaced by a regular one and no boots. While Funky's bandanna has always been red with white polka dots in official artwork, in-game sprites depicted it as purple in the first two Donkey Kong Country games and solid red in the third. DK: King of Swing was the first game to depict him with a polka-dot bandanna in his sprites. Funky Kong is a laid-back primate like Donkey Kong. According to his guide bio from Mario Kart Wii and as he himself states in the story from the manual of Donkey Kong Country 2: Diddy's Kong Quest, Funky Kong abhors adventuring, preferring to aid his friends through other means, such as through his shops and flight services. Funky is portrayed as bold and energetic, and often uses casual phrases in his speech (e.g. "This. Stuff. Is. Awesome. I have no idea what it is, dude, but it tastes radical!"). Also, despite his dislike for adventuring, it seems that he is willing to adventure to help his friends, as he is a playable character in the Nintendo Switch version of Donkey Kong Country: Tropical Freeze. Funky's hobbies include such things as surfing and tinkering with and building various machinery such as vehicles and weapons. "The coolest ape in the world has once again changed his occupation. Some time ago he discovered his predilection for weapons technology. He has succeeded in transforming harmless tropical fruit and colorful feathers into effective projectiles. Switches that are located outside the range of the Kongs or that cannot be activated even using all of one's body strength no longer pose a problem due to the use of these special weapons. The integrated target functions and the add-on target-searching-ammunition make the weapons an indispensable aid in the search for the golden bananas. Funky also offers, as a further service, refilling of the ammunition supply. The weapons and their extensions, however, cannot be had for nothing. But Funky always has especially low prices for his friends." Instruction Booklet: "The sunglasses wearing, coolest of the Kongs. Preferring attack-based contests to races, he's the dark horse of the Jungle Jam." Unlock method: Win the Diamond Cup with a Kong. Guide Bio: "This funky monkey doesn't like adventuring, so he's split his time between surfing, drumming, and learning some of the craziest kart shortcuts around!" "Just surfing the wind currents, dudes. Nothing to get uptight about. Stay mellow, stay cool." "That used to be the biggest city on Donkey Kong Island. It's called Big Ape City." "I don't go looking for trouble, and most of the time it doesn't come looking for me." For this subject's image gallery, see Gallery:Funky Kong. In Issue #261 of Nintendo Power's "The Score," a page listing the results of online polls, Funky Kong was voted the most wanted Kong who is not present in Donkey Kong Country Returns. Although Funky Kong does not appear in Donkey Kong Country Returns, he is referenced by Cranky Kong, who wishes that someone with a plane (such as Funky) could get them to the top of the island. Funky Kong's Mario Super Sluggers baseball card listed his Rookie Year as 1999, even though his first appearance was in Donkey Kong Country, which was released in 1994. In Donkey Kong Country: Tropical Freeze, when the player visits Funky's shop and they highlight the Crash Guard option, Funky will say: "Vehicle troubles? It's dangerous to go alone- take one of these!" This is a reference to the first The Legend of Zelda game in which Link acquires his first weapon by entering a cave and speaking to an elderly man, who offers a wooden sword speaking similar words. This page was last edited on March 2, 2019, at 00:11.